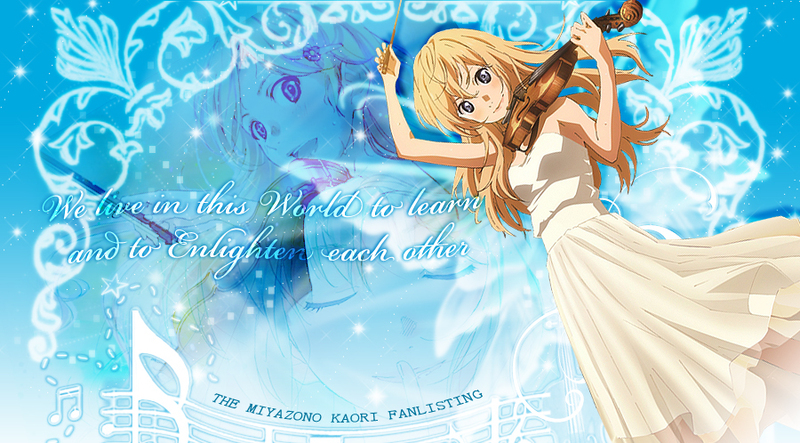 You reached We live in this World to learn and to Enlighten each other, the fanlisting dedicated to Miyazono Kaori, the heroine of the series Shigatsu wa Kimi no Uso! Kaori-chan is a singular girl. I immediately thought that she was particular when Kousei met her and she was playing music to entertain some children. It is a personal thing, but I'm sure that people who like children have a pure heart and absolutely good intensions. 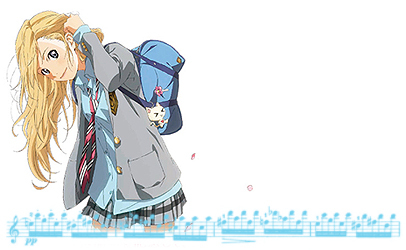 I found out that it was the case of Kaori, who is really peculiar in everything she does. The way she encourages the other, especially Kousei, is direct. If she understands that there's something that is the best for a person, she does whatever she can in order for the person in question to fulfil it. I think she's amazing, she's a very good friend and always tries to do the best for the others, even though it could be a problem for her. She gives good advices and the way she reasons is deep and she usually gives reasons why there would be something that should be done. She's so strong-willed and lively that seeing her and the developments that happen thanks to her is really amazing! property of Arakawa Naoshi, Fuji TV and A-1 Pictures. Layout and contents are ©Miriallia All the images I used are from Google.com.